I used to think American movie posters were the cat's meow until I started encountering examples of what our international friends were doing to sell Yank products in their markets. These far-flung cradles of civilization had a way with design, don't you think? Some of their ideas would have been considered too radical for our shores back then, but they have a startling effect today, and even ones from the thirties seem quite modern to these tired old eyes. I'd check for this stuff at collector's shows, and believe me, you had to look, because foreign promotional material comes in every conceivable size and shape. The samples we have are tiny heralds, which were given away to patrons by way of cooperative merchants, and/or newspapers. We had heralds too, but they weren't generally three and a half by five inches in size! These diminutive keepsakes are fragile as porcelain, and I think, every bit as pleasurable to look at. How any of them survived the passage of so many years is a miracle in itself. Bear in mind that some of these movies were slow getting release dates in their host countries, due to war, quotas, blockades, pirate raids, you name it --- so we can't fix a definite date as to when these little jewels were mined. Suffice to say, there are plenty more if readers would like to see an encore in the future. Talk about capturing the spirit of noir! If this little cameo for Out Of The Past were any blacker, I'd have ink stains all over my hands. A handy magnifying glass just revealed all those swirling colors in Bob's trenchcoat. Can't wait to see how this looks when it's gone up on line. 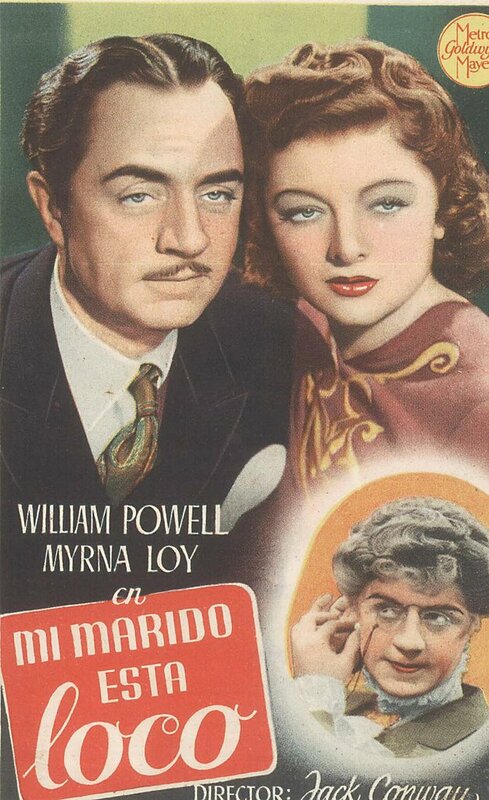 What great art of Bill Powell and Myrna Loy --- and look at that all that color detail in Bill's tie! 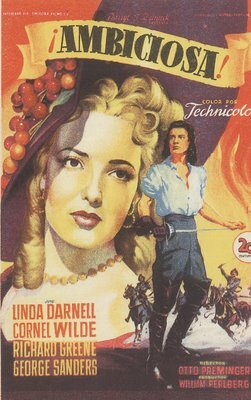 Somebody'll have to help me out with these languages, but it's obvious enough, judging by Powell's femme disguise, that this is Love Crazy. That's the one g.f. Ann likes a lot --- especially the part where Bill gets his head caught in the elevator door. They excerpted that in MGM's Big Parade Of Comedy, Robert Youngson's 1964 compilation. I saw that on a triple bill with Tarantula and The Hustler. Sorry, I digressed. 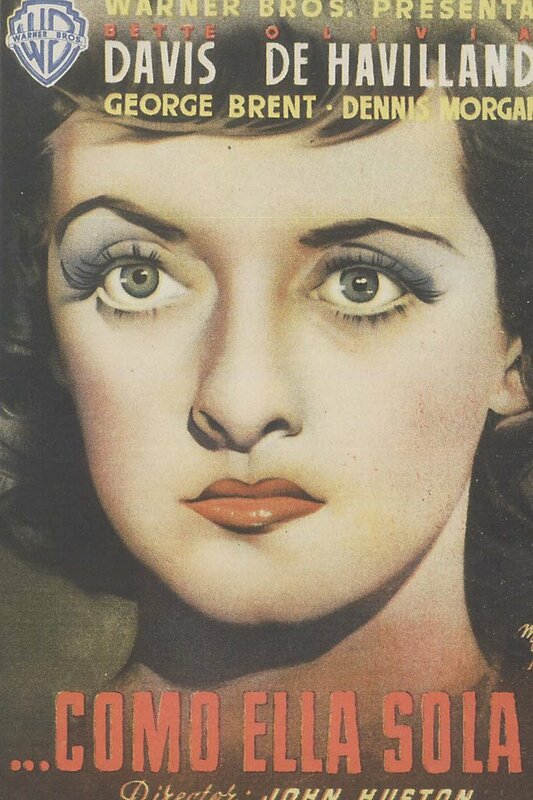 Wonder if Bette Davis ever got to see this stark portrait for her 1942 pic, In This Our Life. 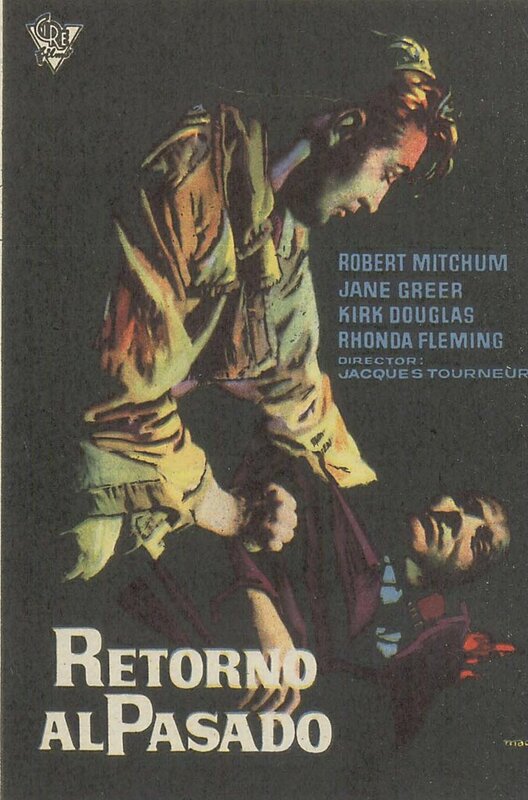 There's always been this legend that the cast of The Maltese Falcon appeared briefly as extras in this movie as a good-luck gesture for director John Huston. I've never seen them, though. Was it even shot? --- or maybe shot, then deleted? Could be the whole thing's just fiction. 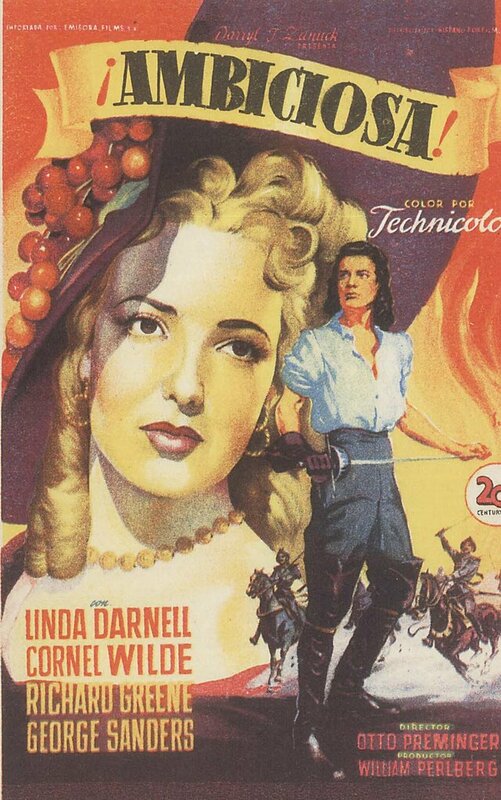 Forthcoming glamour starter Linda Darnell has always been a Greenbriar favorite, and we particularly dig this image of her from Forever Amber, a picture she dismissively referred to as "Forever Under". Even if it had nothing but that fantastic David Raksin score, it would be enshrined among the immortals as far as we're concerned. It's frighteningly ironic to note that Linda nearly burned up in a fire scene gone wrong (Otto scorned the use of a double for her), and indeed her character would perish in flames on two other occasions in movies (Hangover Square and Anna and The King Of Siam) --- making her real-life finish all the more chilling (for the best account of that tragedy, go HERE). 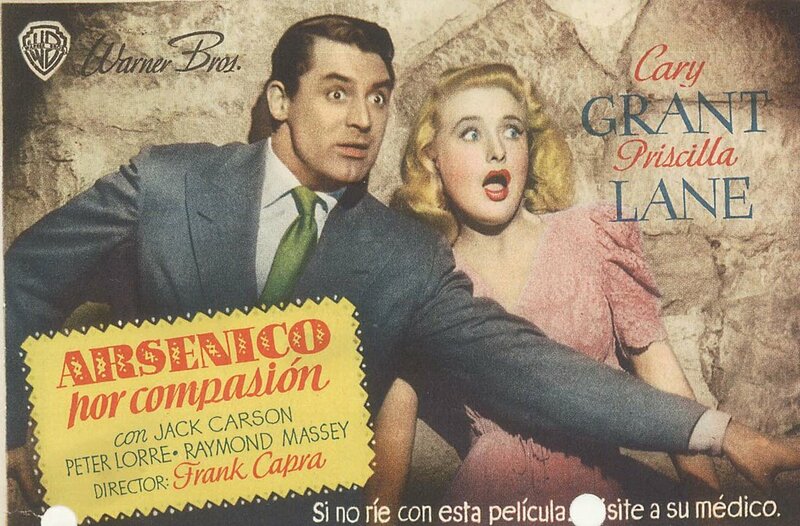 Never have I seen this pose of Cary Grant and Priscilla Lane from Arsenic and Old Lace, but I think it represents the movie as well as any I have seen. 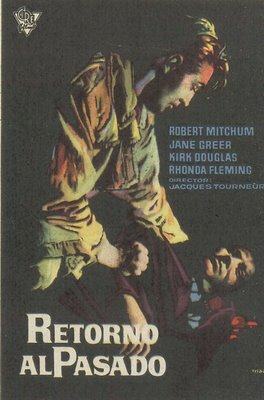 Anyway, it's lots better than the kinda drab one-sheet they used in the U.S. Wouldn't it have been great if Boris Karloff could somehow have played Jonathan Brewster? What a bummer, but somebody had to stay out on the road with the still-popular play and give it hinterland star appeal, so Boris laid down the sacrifice. Just one more reason to love the guy. 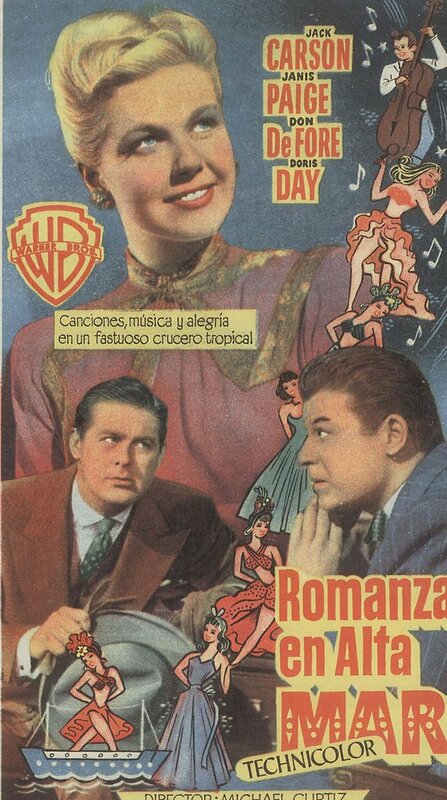 Finally, here's Doris Day in her debut feature, Romance On The High Seas. 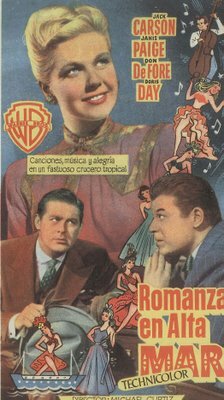 Great movie, but Jack Carson seems an unlikely romantic partner for Doris --- yet there they are in a clinch for the fadeout, and she says in her autobio they had a thing offscreen as well. Seems Jack was a pretty morose type when the bright lights were down. Used to sit around home and drink by himself. Great actor, we think, or did we say that before? And how about that Don DeFore? How did he miss the brass ring? Hal Wallis thought enough of him to extend a personal contract. Too bad the big screen wasn't more hospitable to Don. He was always a likeable presence. What a startling poster of Bette Davies' movie. Great stuff! I find some of the old Czech posters particularly interesting and modern in their approach. Please post more, I am very interested in vintage posters. Jack Carson rocks! He's got to be one of the most underrated actors ever. Equally at home in comedy and drama, and always solid. I can't imagine him in "Of Thee I Sing" (and wish Hope had gotten to make the movie), but have no doubt he could pull it off. What a guy.